If more than one channel is selected in the pattern editor, channel record select and channel reset shortcuts are now applied to all selected channels. Support for floating point WAV files written with old versions of Syntrillium CoolEdit. 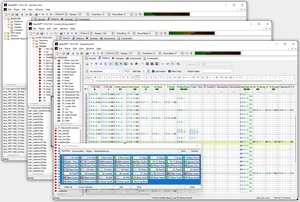 it is now finally possible to load more than 64 soundfonts through the tree view. Fixed a rare crash in the tree view introduced in OpenMPT 1.22. When using the name filter in the plugin selection dialog, a matching plugin is highlighted by default instead of the "no plugin" entry. Improved precision of the polyphase resampling filter and disabled some questionable "optimisations" in linear and cubic resampling modes which would disable interpolation altogether under some circumstances. Several other small playback compatibility improvements for MOD, IT and XM files. Added extra smooth ramping option in Song Properties to emulate Fasttracker 2's ramping algorithm (kills most percussion sounds). Greatly improved support for some previously unsupported AMS and PTM effects. Repeated pattern events in MT2 files are no longer lost. Replaced LHA decompressor. More sub types of the LHA format are supported now. Added option in the MIDI configuration to ignore certain MIDI CCs when recording to pattern. Normalizing is now also available for 32-Bit output in WAV export. Always enable "Export as MP3" menu entry and display a useful message box when no MP3 codec is found. My comment is going to be very generic, but hopefully convey the appreciation I have for the stuff you devs do. Awesome job, thanks for the new release!